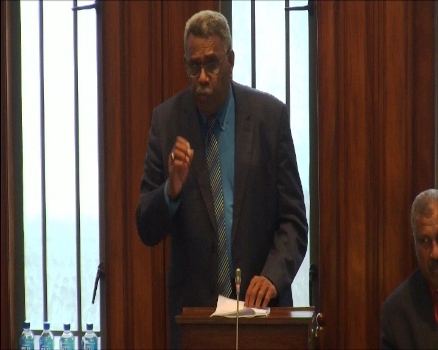 Debate on the 2017 budget turned nasty today as Opposition Whip Ratu Isoa Tikoca made prejudiced statements about Muslims. Ratu Isoa took the bigoted path accusing the Minister for Economy Aiyaz Sayed-Khaiyum for quote…. “leading the nation with his kind" and giving jobs to only people of the Islamic faith. Tikoca’s speech had little to do with the budget – and more to do with religious prejudice. Tikoca then read out a list of around 14 names of those he accused of being appointed to key positions in the government because they shared the same faith as the minister for economy. Mohammed Saneem the Supervisor of Elections, Permanent Representative to the United Nations in Geneva Nazhat Shameem and Permanent Secretary for Industry and Trade Shaheen Ali were also accused of being appointed without merit. Meanwhile, Economy Minister Aiyaz Sayed-Khaiyum also hit out at numerous personal attacks made against him. Ratu Isoa was warned by Deputy Speaker Ruveni Nadalo to refrain from any comments that may raise ethnic or religious tension and animosity.